PracticeUpdate saw a 7.9% conversion rate, predominantly healthcare professionals, with TrendMD. As a unique educational online resource for multidisciplinary medical content and expert insight, PracticeUpdate’s goal is to connect healthcare professionals with news and information that matters most for patient care. This is achieved through the influence of their expert, specialty-based editorial boards, who cut through the mounds of medical literature, and help healthcare professionals focus on key updates in the least amount of time. Interested users gain access to the full suite of PracticeUpdate’s resources by registering (which is free). The content on the site ranges from the most important research to key news articles, from expert opinions to education resources - all tailored to meet the healthcare professional’s needs. As is typical with sites requiring users to register, PracticeUpdate’s main goal when joining TrendMD was to increase the volume of engaged readers coming to and registering for their site. Existing strategies to bring in new visitors include email acquisitions, banners, conferences, and partnerships with various organizations - all have been used with varying degrees of success. TrendMD was first introduced as a strategy for PracticeUpdate in early 2016. Over the course of that year, they tested various configurations of TrendMD’s offerings to drive engagement and conversions. After running a few tests in 2016, PracticeUpdate started a promotional campaign in January 2017 to drive registrations. Their main goal was to drive high-quality conversions (specifically health care practitioners) aiming for a low cost per conversion while increasing conversions per month by 30%. Consulting with their Account Manager at TrendMD, PracticeUpdate assigned a monthly budget. They then decided to promote all of their content (over 42,000 articles) across the entire TrendMD network (no specialized targeting of any kind), allowing the algorithm to do its part deciding what content should get promoted where and to whom. 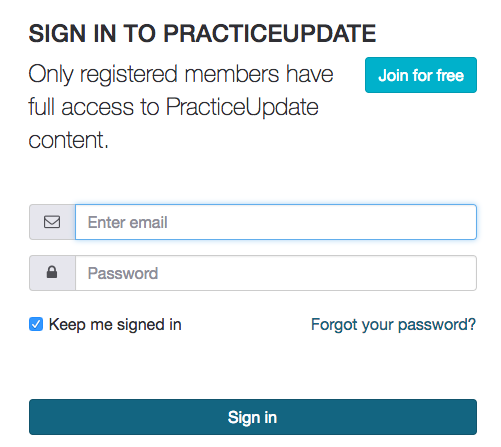 To encourage registrations, PracticeUpdate has a register/sign-in prompt that displays under the article title for readers who are not signed in. The full budget was implemented in January 2017 and optimizations were made over January and February to improve the signup flow and ensure fully visualized conversion tracking. Following the optimization period, PracticeUpdate exceeded their targets in all aspects. From March to May 2017, PracticeUpdate exceeded their target number of registrants with an average conversion rate of 7.9%. Of those registrants, a majority were healthcare professionals from targeted specialties. With run of network promotion of a large volume of content with a monthly budget, PracticeUpdate received high quality traffic from high quality sources with TrendMD.